Fleegle's Blog: Lots of Frogs!! Bet you thought I frogged the Black Widow Spider Queen shawl, didn't you? Fooled you! Click on each picture for a real-sized view. This design turned out very well, but I will be stitching two or three variations for my August embroidery class in London. Your embroidery so beautiful! And executed with such skill and attention to detail. Having done a little crewl embroidery in the past, I can appreciate how precise the placement of each stitch is. A lovely and whimsical piece! Thank you for sharing. Wow, that's amazing! Simply stunning, particularly the larger photos. I'm so impressed. I loves that giggle-bunny! He does make me smile. Thanks, Fleegle. So delightful! 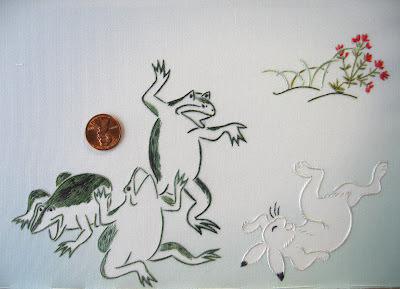 The frogs and the ROFL bunny put a huge smile on my face. 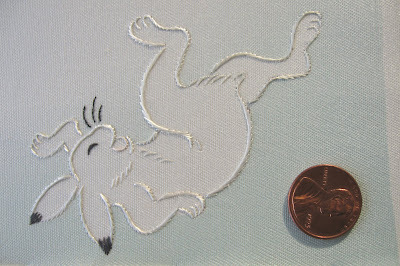 :) I love the detail in the bunny and how well your stitches represent fur. Hi Fleegle, your embroidery is beautiful. I have just begun to learn Japanese Embroidery. The design I am currently working on (Venerable Friends with Chrysanthemum) has small clouds worked in staggered diagonal stitch. I took out my first attempt because I wasn't happy with it. I love the close up on the Rabbit which shows what I should be aiming for. I guess your blog is primarily about knitting but I hope to see lots more of your Japanese Embroidery. Pretty pleeeease!